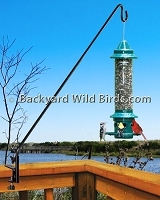 Backyard Wild Birds has a large selection of Deck Bird Feeder Poles that work with different style of decks. Deck Poles are useful to hang bird feeders off of a deck and give a close up view of backyard wild birds. There are many choices on which Bird Feeders to use on these poles. It depends on what type of seed or food you would like to use to attract specific types of wild birds. See Birding Info article on the many different Deck Bird Feeder Poles Styles. Sunflower seeds are the most popular to use to attract a variety of wild birds. For sunflower bird feeders on deck poles, they need to be capable of providing their own defense against squirrels, raccoons, etc., if you have them in your area. This is because there isn’t a way to put a Pole Squirrel Baffle on them. Some examples are the bird feeders on the Extended Pole Squirrel Blocker Feeder and the Extended Pole Squirrel Proof Feeder. Some other good choices to serve sunflower seeds would be from the Squirrel Proof Bird feeders category put on a Deck Pole. Any of the Deck Bird Feeder Poles can be used with Hummingbird or Thistle feeders, since they don't require self defense from squirrels or raccoons. A few examples are our Hummingbird Feeder With Deck Pole and Deck Pole With Hummingbird Feeder. But you are not limited to these, you can use any of the Hummingbird Feeders or Thistle Tube Bird Feeders on any of the Deck Bird Feeder Poles.